Who Remembers the Barouder SE 5000? 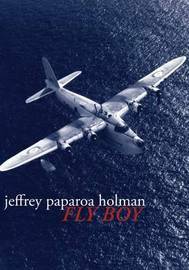 A poetry collection exhibiting a long-term obsession with planes, especially fighter-planes from World War II, planes, planes, and more generally, flight, Fly Boy is filled with evocative replications of Canterbury poet Jeffrey Paparoa Holman’s basic, vigorous and deeply rooted song of boyhood, imaginative freedom and time past. A bit like Seamus Heaney’s nostalgic paeans to household items, Paparoa Holman’s poems show an art of linking vivid, musical phrases into small lyrical vignettes that read like private memorative recitations: revisitations of a formative aviation manual which the poet evidently pored over as a boy, meditations on birds and bird flight, pilot death, gliders, Antarctic Austers, Fokkers, Constellations, Vulcans, Barouders and Sunderlands. Weighing in at a substantial 1.2 kilogrammes, this solid volume carries within its wrist-twisting four hundred plus pages, the freight of a lifetime’s scholarship. Reviewing it now, a few weeks after Judith Binney’s early death at seventy – when she might easily have worked on fruitfully for another decade – it is difficult to avoid a valedictory note in a review that should legitimately be solely concerned with the text itself, a work that must now earn its keep independently of its author’s life, or death. That said, it will be necessary – and fitting – at the conclusion of this article to utter a poroporoaki in Te Reo Māori, the language of the world she set out to map some forty years ago. And it is the connection between the concept of oral history and its relation to the written word – a linkage that is central to Binney’s project – that will be the necessary focus here. The book is a chronological series of collected articles that trace her intellectual development, through a Pākehā revision of Māori histories from 1975 until 2010. It begins with a close examination of missionary lives, goes on to discuss Māori Christianity, the rise of Te Kooti and Tūhoe prophets, Tūhoe and the land, oral histories and women’s stories. In what must surely now be seen as something of a Festschrift in her honour, the collection begins with a 1975 paper revealing the Rev. William Yates’ homosexuality, and his inner torments in attempting to reconcile his evangelical faith with a prediliction for Māori boys. The Māori Renaissance and the parallel rise of a new generation of Pākehā baby-boom historians began to coalesce at the time of these early publications. Binney was taught by Keith Sinclair, and while born in 1940 – and so not exactly in the same cohort as James Belich, Matthew Wright and Paul Moon – she is charged with the power of the same deconstructive zeitgeist that actively dethroned old Pākehā ‘saints’ while resurrecting and sanctifying many old Māori ‘sinners’. In 2009, as a member of Victoria University’s International Institute of Modern Letters Writing for the Page group, I had the privilege of previewing many of the initial drafts of the essays which form the substance of White’s How the Land Lies. A year later it’s a pleasure to see these collected to form a cohesive record of a man’s personal journey, offering the opportunity to immerse oneself in another’s fascinating mindscape. While each of these seventeen essays has a central topic – from music, to dam building, to fishing, to heroes — it is its echoes of family history, of a dislocated childhood, and of growth into self-aware maturity, that unify this work and the consciousness it displays. You are introduced to White’s world-view as it is now, which then leads back into the formative years: his recollection of childhood experiences on the South Island’s West Coast with all their anxieties and turbulence. But White is not so much concerned here with memoir, rather with attempts to get to the nucleus of the forces that have influenced and shaped him, and to locate the nub of things, a centre. He reflects on parents, on siblings, on communities, on relationships, on both Pakeha and Maori ways of telling stories of place. He comments on the many places he has lived, on his various means of employment, and on his personal struggles with physical health and psychological well-being. Photojournalism is politics by other means, a form of persuasion, a type of propaganda, where photographs might proselytise on behalf of a world-view. Brian Brake (1927–88) was, as this book tells us, ‘New Zealand’s best-known photographer’, certainly during the latter part of his lifetime. But, as Athol McCredie, the book’s general editor, goes on to point out in his lucid and succinct introduction, though Brake had a successful international career and was a media legend in New Zealand, ‘the generation of “art” photographers who had emerged during his absence overseas largely ignored him’ — there is no School of Brian Brake, and meanwhile his images which once featured so prominently in international anthologies, such as Helmut and Alison Gernsheim’s Thames and Hudson survey A Concise History of Photography, have disappeared from more recent authoritative publications, such as 2004’s Magnum Stories: Sixty-One Photographers (edited by Chris Booth for Phaidon). If Jack Ross has not read J.G. Ballard’s The Atrocity Exhibition, someone should get it for him. Kingdom of Alt has some of the serial agonistic airs of that work, but it is more dispersed: Kingdom of Alt is a collection of tales and takes involved with relations between real-life events and imaginary fictions that score the traumas of those real lives. The narrators include variously: a twenty-or-so female university student, a thirtyish divorcee taking evening poetry classes and making freakish death films from video fragments, a middle-aged man, Jack Ross himself as the speaking author, and other, both fragmentary and unified, human-ish points of view. The book opens with ‘Trauma’, a compelling short story that lampoons the difficult-subject liberal university course, the traumatised people who take it, and the suiciding student who seems to be the inevitable result of that equation. The story is largely presented as a series of journal entries including marginal edits from the narrator. These edits tend towards smoothing out her self-presentation, so that the student will come across as nicer than her first-thought compositional impulses might indicate. Thus ‘correcting’ the university journal or essay is associated with self-editing as making nice. By extension, smoothing out and correcting writing – making ‘good’, finished art – is presented as a making-nice of the painful equations of human culture. Kingdom of Alt does not want to make nice in that way. The fictive framing of this story, as with others in this collection, is multiple: real-life journalism, psychological theory, an embedded story, and the draft composition journal bracket each other, while the tale moves toward its ‘resolution’ of sorrow and sympathetic incomprehension.